As promised in the comments of my previous post, I am going to break down the difference between January 2015 and January 2016 in terms of region and thickness. First the outline of the situation. 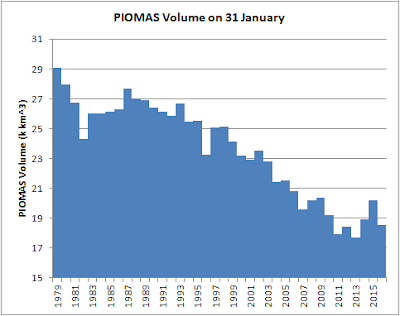 As of 31 January 2016 overall PIOMAS volume is fourth lowest, this follows increased volume over the last few years. January volume has fallen relative to recent years over January due to weather which seems to be highly anomalous. 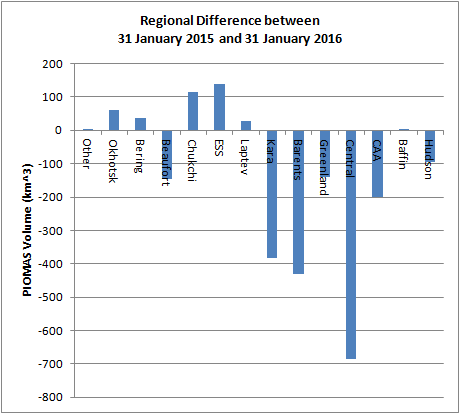 Between 31 January 2015 and 31 January 2016 volume fell by 1.693k km^3 according to the main series of PIOMAS volume. For my calculations based on gridded grid box effective thickness this fall was 1.692k km^3, for my calculations based on Gice sub grid thickness distribution this was 1.653k km^3. I have discussed these differences with Dr Zhang previously, in the first comment of this post one possible reason is explained. Anomalies from the long term mean reveal this drop. The key question is where does this volume drop come from, using PIOMAS gridded data it is possible to answer this question both in terms of location and thickness of ice. To start this decomposition I begin with PIOMAS grid box effective thickness. It is clear that most of the loss between 2015 and 2016 is in the Central Arctic, and the regions close to the Atlantic ice edge. 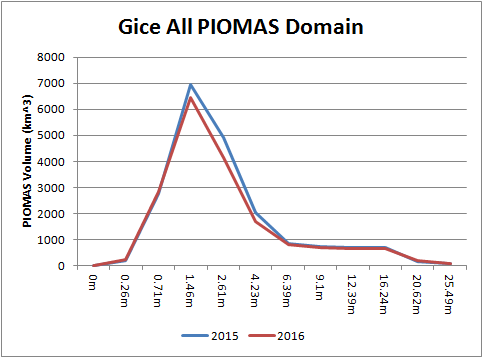 The PIOMAS Gice data is the sub grid thickness distribution, it is explained in detail here. However in short, looking at the following graph, the thickesses on the horizontal axis are the centre points of sub grid thickness bands used within the PIOMAS model, the vertical axis gives the volume for each of those bands. So for the whole of the region covered by PIOMAS (PIOMAS Domain), the thickest ice (6.39m and above) is seen to have barely changed since the end of last January, the change is in ice from 1.46m to 4.23m thick. How this impacts sea ice thickness in PIOMAS for the whole of the Arctic Ocean is seen in the following plot of average thickness for the entire Arctic Ocean (Beaufort, Chukchi, East Siberian Sea, Laptev Sea, Kara Sea, Barents Sea, Greenland Sea, Central Arctic, Canadian Arctic Archipelago). This plot is calculated from grid box effective thickness, not from Gice. Regions follow the lead of Cryosphere Today. So overall average thickness is down, and medium thickness volume is down accounting for the drop in volume since 31 January 2015. Now to delve into the regional detail of the Gice data. I'll start with the Central Arctic where we see little change in the thickest ice, but a drop in medium thickness volume. Breaking this down into three bands of thickness we see that the medium thickness drop is not highly abnormal. 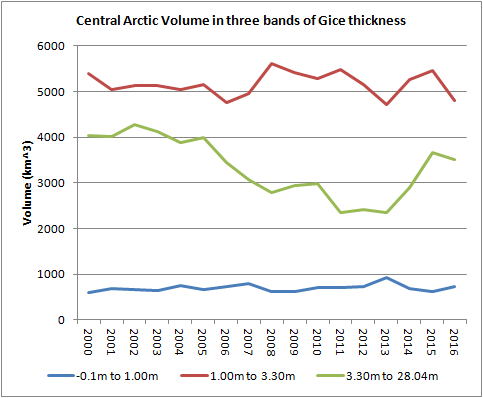 While volume in the thickest band of thickness is back to levels of 2006, as it was last year and the volume of this thickest ice remains abnormally high in the context of the preceding long term decline of volume of thicker ice. 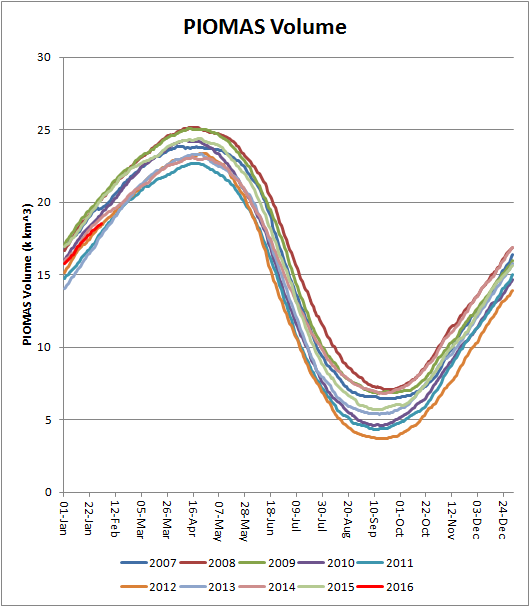 In the summer, whilst conditions within the Central Arctic are critical for a record low extent such as in 2012, a rapid melt out of the region of the Beaufort, Chukchi and East Siberian Seas is a key ingredient to get the ice edge into the Central Arctic to facilitate large losses in that region and very low extent by the end of the summer. I call this region of the Beaufort, Chukchi and East Siberian Seas the BCE Region. 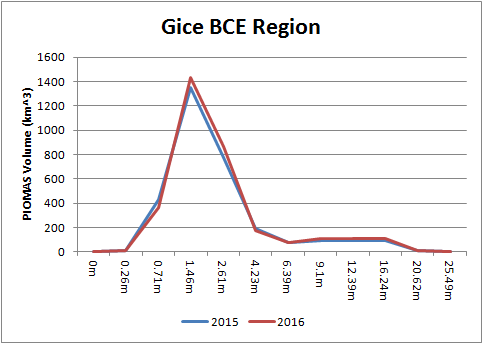 Here is the Gice distribution for that region. 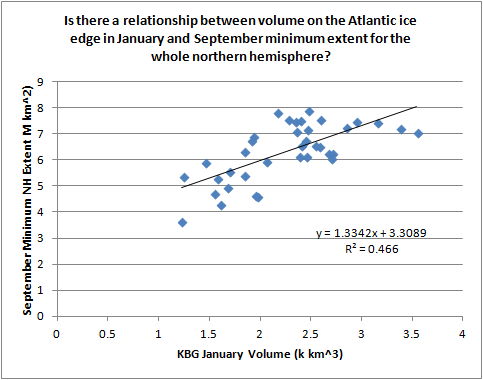 For the BCE region as a whole ice is marginally thicker, in the context of actual volumes involved it is very similar to 2015 on 31 January 2016 (2.13k km^3 in 2015, 2.23 in 2016). With the transition of the BCE region to a first year ice dominant state all three seas in that region have converged in winter thickness, in January the thickness has converged on around 1.5m, January 2016 is statistically indistinguishable from that new regime. Turning now to the region enclosing the Kara, Barents and Greenland Seas, as is to be expected from the weather conditions in January, with strong influx of air from the North Atlantic onto the Arctic Ocean ice pack, the regions bordering the Atlantic have taken a hammering. Sea ice volume for all thicknesses over 0.71m have collapsed. So that is the situation in a qualitative sense, what of the numbers? In the following 'Other' is all regions except the ones singled out, and a three band thickness breakdown is made based on the 12 thickness levels of the Gice sub grid thickness distribution. From the second section of the table, if we assume that BCE and Other cancel out, then nearly 60% of the difference between 2015 and 2016 on 31 January is attributed to Kara Barents and Greenland, which are adjacent to the Atlantic Ocean. A significant 40% of the loss comes from the Central Arctic much of this seems to be from thinner ice, the 1.0 to 3.3m volume is substantially down while the 0 to 1.00m band is up (probably due to mass shifting downwards in thickness). However from the final panel of the above table the impact on overall volume to the Central Arctic of its 41.2% contribution to the overall loss is small. 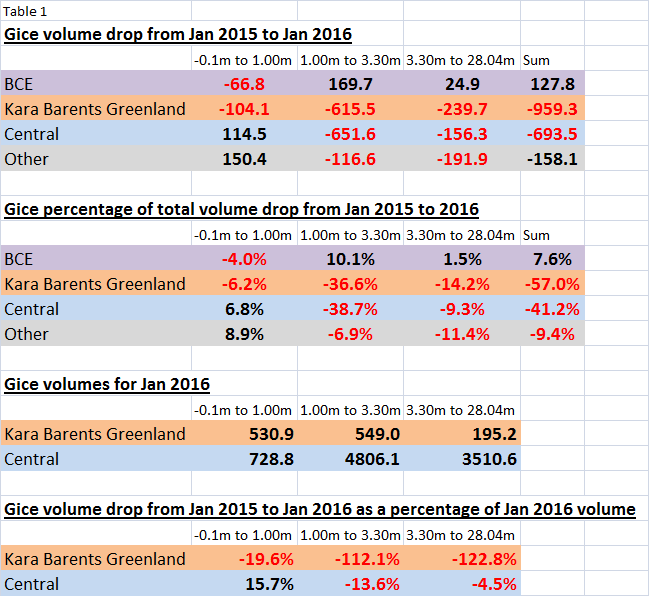 In contrast to the situation in Kara Barents Greenland which is a massive impact relative to volume on 31 January 2016. So the situation within the Arctic Ocean Basin (Beaufort, Chukchi, East Siberian Sea Laptev, Central) does not indicate an exceptionally poor ice state which could be taken as predictive of an imminent record this coming September. However the situation in Kara, Barents and the Greenland Seas suggests a virtual collapse of ice state, could this act as a gateway to greater inroads into the main ice pack this summer? 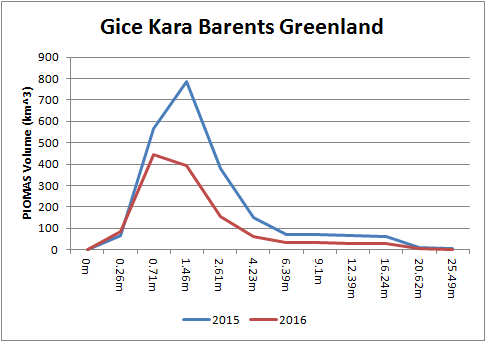 I have taken NSIDC Monthly Extent (G02135) for September and the sum of volume in the Kara Barents Greenland (KBG) region in the preceding January. These variables are plotted together in a scatter plot below. The answer is that there is a relationship, it happens to be statistically significant. However this is merely telling us that as September extent drops so does January volume, and they both drop due to global warming, not necessarily because January volume drives the September extent. So I remove the trend by taking the interannual differences of each series and plotting them together on a scatter plot. This provides a better answer to the question that concerns us: Does a really low volume in the KBG region tell us that the following September will have a low extent? 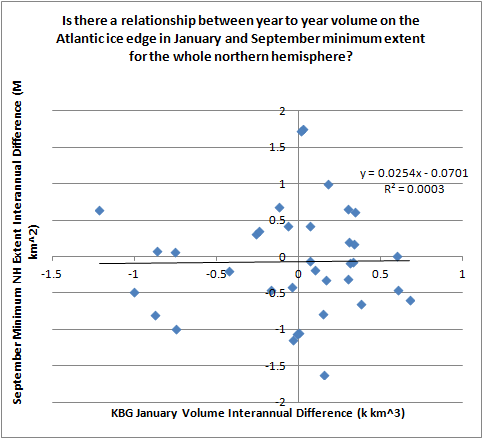 Once I have removed the twin trends of loss the trend line is level, so year to year variations in January volume for the KBG region have no relationship to the following September extent for the Northern Hemisphere. 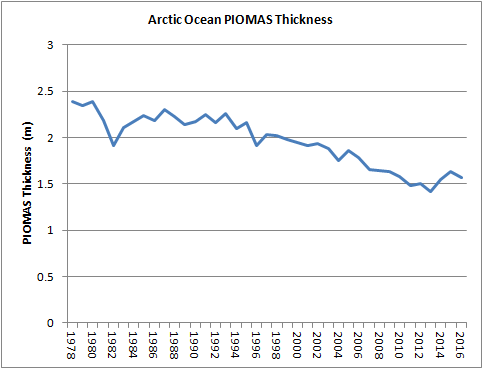 As of the 31 January 2016 PIOMAS data, in my opinion it is hard to have a reasonable expectation that conditions as of that date indicated an impending crash of sea ice. However Andrew Slater's calculations of Freezing Degree Day anomalies indicates that the situation may now be more extreme. EDIT - source. However, set against that, the actual temperature average through February so far is still very cold over much of the pack. The temperature scale is in Kelvin, 273K is roughly 0degC (actually -0.15degC), much of the pack is around -20degC. Taking the simplest model of sea ice growth, plugging in a start thickness of 1.5m at the end of January and an average temperature of -20degC, ice growth through February would be about 20cm, only a few cm below the typical thickening between January and February average thickness for the Central Arctic in PIOMAS over the last decade. Using the simple model and a starting thickness of 1.5m growth for a an average temperature of -30degC over February is 29cm. The message here is that current conditions should not be expected to halt ice growth over much of the pack, despite the highly abnormal situation. Possibly later in the coming week, or early the next week, we will have PIOMAS data. Then we'll have more than just guess work with simple physics, we'll have the proper results from a proper model. Thanks for doing this. It's interesting and good work as usual. I'm surprised the thick mass of ridged ice that was blown into the Central from the Atlantic side is not making a bigger difference. Now's the chance for you to inform me. What mass of thick ridged ice? I've been busy with work and haven't been keeping up to date as I usually do. Not sure how best to do this. shows a region of thick, red, ice forming on the Atlantic side of the central basin as the winter winds push the new ice forming in Barents north toward the pack. The wind was relatively warmer than usual, but remained below freezing temps so the thin new ice in the Barents was not melted, it was transported and stacked up. The polar portal thickness estimates illustrate that progression. shows a similar mass that is now sitting near the north pole and extending down toward Greenland. These are two different systems that indicate the same basic process, but the specific location and thickness of the ridging clearly differs. 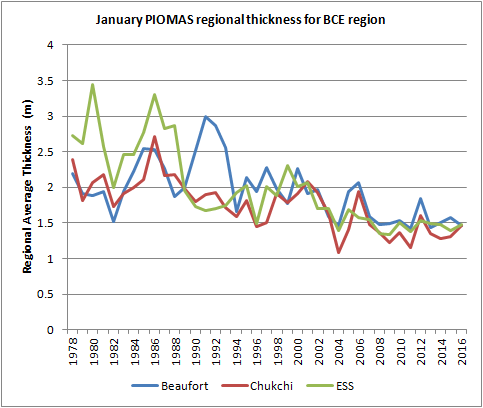 The January Piomass plots did not show this same region developing, but I expected the February data to catch up with the others. The HYCOM plots showed a lesser sized ridge form and then blend into the Atlantic side of the Basin. The reported location of the ridge, per polar portal, has it continuing north and it may get caught up in the Beaufort Gyre, to some extent and thus avoid being swept south through the Fram to doom in the Atlantic. If a significant portion continues north/west, then it will influence the amount of thick ice in the Basin for the melt season. I'm curious if the tradeoff between the moderated temperature in the Basin during Winter freeze is offset by the ridging induced by the persistent north wind from the Atlantic. It's how much ice is subject to the thermodynamic limits of thickness via growth for the prevailing temps versus the accumulation of the ridged ice that is thicker than the thermodynamic limit. If the winds flush it out the Fram, it becomes a minor influence to the Atlantic temps as it melts. But if it continues to get pushed into the Basin and spin through the Gyre, it could add to the thick ice that typically hangs around as MYI. As it is more than 2 m thick, it's probability of survival for the summer is pretty good. Look again at the PIOMAS blink comparison from the previous post. There is a slight rise in January thickness in the region you're talking about this January. One issue I have never found the time to investigate: I know how PIOMAS calculates the thickness given as grid box effective thickness. 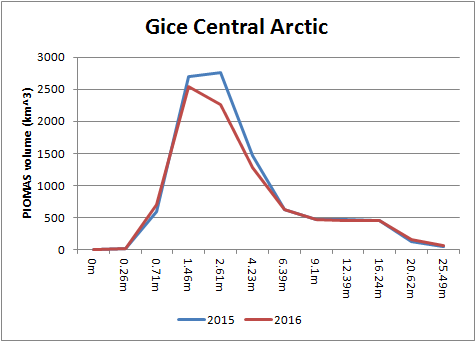 But some of the other models like DMI's Cice could be using a different approach - that might explain why they give thicker ice. Even in a region with an effective thickness of say 2m in PIOMAS, there is found to be an amount of much thicker ice within the gice sub grid thickness distribution. 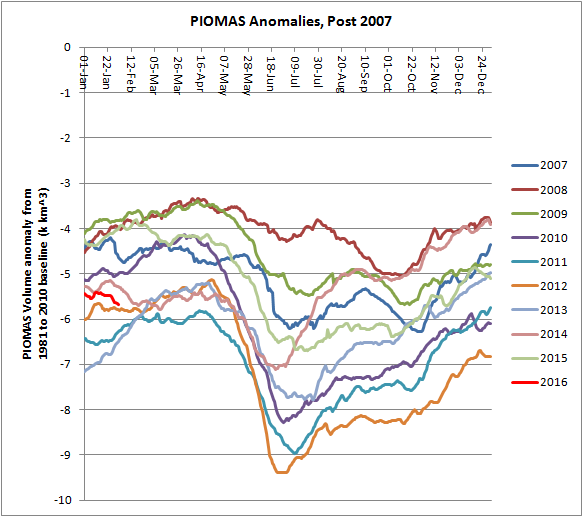 That noted, PIOMAS does seem to give a 'smeared' impression when one plots grid box effective thickness. This might be down to resolution, PIOMAS has a very variable resolution, towards 45degN the grid boxes are of the order of 4000km^2. But the grid is centred in Greenland, and around that central area grid boxes are of the order of 200km^2, although much of the Arctic Ocean is typically 400km^2. Contrast this with DMI's Gice which has a grid box resolution of 10X10km, or 100km^2. This alone might account for the 'smeared' appearance of PIOMAS, and small(ish) scale features might not appear as strongly as the lower resolution means that the model physics don't 'build up' such features as strongly as in a smaller model. PIOMAS could still be a good indicator of large scale volume because those errors can be naively expected to operate both ways (less and more than actual on a small scale). Your links remind me of Cryosat - thickness and volume for the whole region covered are very similar to last year and well above the preceding three years. I still want to see more Cryosat 2 data to be confident in it. I have 38 years worth of PIOMAS data and have been studying the data and using the gridded data in analysis for three years, that's why I have more trust in PIOMAS. I just need more Cryosat 2 data to start relying on it as I do PIOMAS. But before I can do that I will need to find the time to code the handling of Cryosat 2 gridded data. That's not easy since I got promoted into a senior management job. scrub those comments about thickness this year, the Cryosat 2 data hasn't even got last Autumn and this winter up - I didn't notice! I am now cash rich and time poor. It's one of those promotions where the MD comes to you and says there's nobody else qualified, I couldn't really say no. Had it been 'advertised' I wouldn't have applied. How is the Volume Pulse going? Why is extent so low?